This is a promotional deck for Absolut Vodka, which was made popular by Dan and Dave Buck. It is printed on a very thin single ply stock (reportedly, a deck is 5 cards thinner than a deck of Bicycles), with a smooth finish. Each numbered and court card feature a drink recipe with Absolut products (they're the same for each suit). 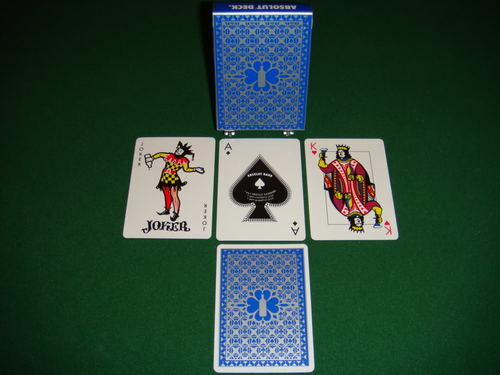 Some of the court cards are reminiscent of the Guy Fawkes-mask from the movie "V for vendetta".